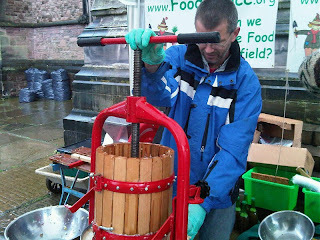 The Treacle market organisers once again invited us to attend the Sunday market at the end of October to demonstrate how surplus apples and windfalls can be converted into excellent apple juice. We had a great site just in front of the church, and despite the continuous rain, it was a really good day with lots of visitors and lots of interest in Food4Macc and Food4MaccDirect. Huge thanks to all the volunteers who braved the weather and made it a great success. 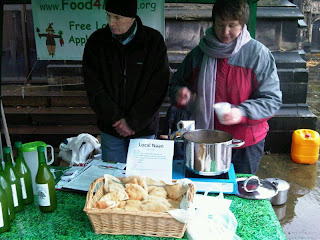 Yvonne had made a fantastic vegetable curry which was was consumed with Ruth’s excellent Naan bread. With the aid of a large mincer to chop the apples and a hand-operated press, we converted more than 120lb of apples into fresh apple juice. and had about 350 people tasting it - and everyone who tried it thought it was excellent!